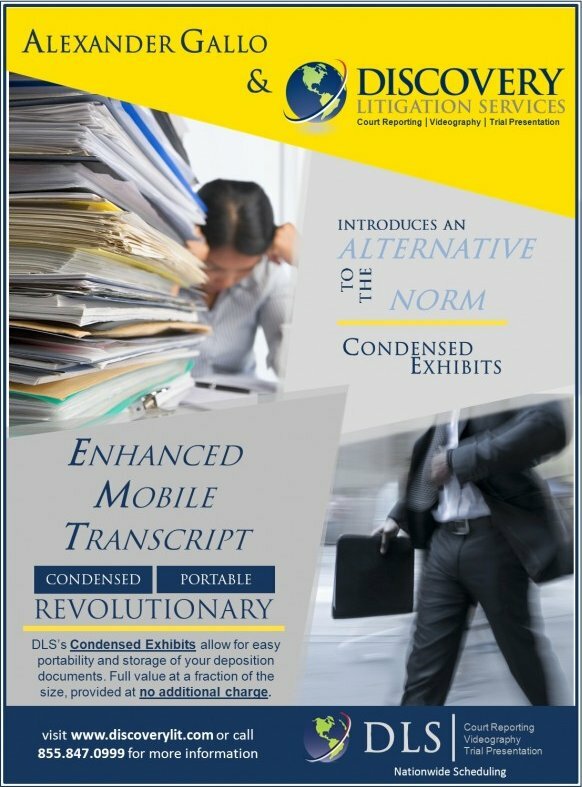 Alex Gallo and DLS introduce the Enhanced Mobile Transcript "EMT" and condensed exhibits that revolutionizes court reporting by making the transcript and associated exhibits truly portable. "We believe the EMT is a revolution in how clients will come to use the Transcript" said Alex Gallo, DLS' CEO and President. "The EMT contains not just the traditional condensed transcript and word index but also condensed exhibits and personalized tabs in a separately bound portable transcript". 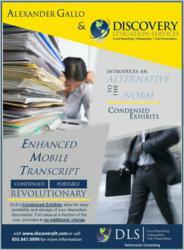 The EMT allows for easy portability and storage of your deposition documents. Full value at the fraction of the size, provided by DLS at NO ADDITIONAL CHARGE. Clients can either schedule the deposition online, with all aspects of the deposition - including transcripts and exhibits, invoicing and payments accessible through the website: http://www.discoverylit.com or call us at: (855) 847 0999 or via email at: customerservice(at)discoverylit(dot)com. The DLS goal is to make the deposition management process as straightforward and painless as possible. DLS, based in Atlanta Georgia, with offices in Florida and California, provides its clients with exceptional service in the Court Reporting, Video and Trial Presentation space.